The umbrella planter arrived and is perfect!!! Received my cell phone holders last night and really am very pleased with them. You do great work!! The packaging was superb. Will be calling again in the near future for another order. Got the cow butter dish today.....awesome!!! The umbrella planters have arrived. Thank you so much. They are absolutely beautiful. I love them!!! I am using them for a bridal shower and was planning on giving them all away as gifts. I love them so much, I plan on only giving away 1 now!!! The cow butter dish made me happy beyond belief. I really mean it...I love it!!! I described it as the best new addition to the house since my 8 week old daughter was born. I just wanted to let you know my daughter loves the cow butter dish! I ordered a butter keeper a few years ago and my daughter loved it. I decided to order one for my son and another one for me. I enjoyed working with you on deciding which decals to use since the one for my son was a unique request. You warned me that you would be very busy before the holidays and that I might not receive them before Christmas. I was surprised to receive your email saying they were shipped last week. They just arrived today (12/22) and they look wonderful! They were securely wrapped and clearly marked. It’s been a pleasure working with you and I plan to contact you when I need another item. Thanks so much. The butter dish arrived today...safe and sound. You did a great job on the butter dish and the packing! Received my violet pots today, and may I say, I am so pleased with them! They are so colorful and I was really impressed with how they were packed. I was also very happy to see how fast they were shipped. Thanks so much....I will be back! Got the planter. So love it!!! It's perfect!. I will send you a pic after I plant something in it. Planter arrived today...absolutely beautiful!! Thanks so much. The violet pots arrived and they look so adorable!! Thank you so much for doing them for me. You are soooooo wonderful!!! Just wanted to let you know that the umbrella planter arrived. It is perfect!!! I planted some coleus I started from seeds in it and put it on my patio table this morning. The violet pots arrived in perfect condition! They are wonderful and thank you so much for a job well done!! I'll send a photo once I get all the "kids" settled in their new homes. I received the shell soap dispenser and it is really nice and was wrapped perfectly!!! The deer arrived safely this morning! packaging! It's beautiful and I'm sure my grand daughter will love it! I LOVE this violet pot. It was exactly what I was looking for. This was a gift for a friend who's violet was very sad. Happy to report great growing in this new pot!! PERFECT!! Absolutely LOVE this violet pot. Will be ordering more! Gorgeous violet pot! Shipped fast and was expertly packed. I received my umbrella planter and it is beautiful and was perfectly packed. I have been looking for a wall frog for about 5 months and was so glad to find one. It arrived in perfect condition and was wrapped very meticulously. Such a beautiful violet pot and I can't wait to get a new violet for it. The violet pot was packed so well and arrived in perfect condition. Looks exactly like I hoped it would. Beautiful piece. Thank You Sandy!! The deer is beautiful and I love the pure white glaze. She is in a special spot and thanks again for sharing your talents! The violet pot is absolutely beautiful. Shipped and wrapped where no damage could ever happen!! Fantastic Job! The fresh butter keeper is of excellent quality. Very well packed. The picture did not do this tart burner justice! An absolutely beautiful piece and I love it. Arrived safely and quickly via FedEx. The deer is beautiful! Fine detail and very delicate. Thank you so much! The art deco deer are beautiful and were very well wrapped for shipping. FedEx delivered the butter keeper this morning. It is so cute. I’ll give it to my daughter this evening when she gets home from work. Thanks and I will definitely keep you in mind when I want to replace or add more to my collection. It’s been a pleasure doing business with you. Such a pretty jam jar. Thank You!! I picked up the dish yesterday...I love it :) The color is perfect and the red runs through the veins of the leaf! Thank You! Do you have an online website where I can look at more of your work? I received my cow butter dish today! Thank you so much, She really is beautiful! I will send you a photo of her in my kitchen! I am sure she will delight all my dinner guests too! My shipment arrived today. All is OK and the deer are really nice. Just heard from my sister-in-law. They received and love the umbrella planter. Thank you so much for your fantastic work and your husband's impeccable packing! My cat and bunny violet pots arrived today in perfect condition. They are too cute for words. Just perfect. Thanks so much. I'm sure I'll shop with you again. This is a beautiful violet pot!!! Can't wait to add my variegated violet. The violet pot arrived and it is absolutely beautiful and my violets look beautiful in it too! The rooster set arrived today and they are truly beautiful and we love them. Thank you for shipping them to Hawaii. Got my beautiful umbrella planter today!!! Thank you very much! The African violet pots have arrived and they are beautiful....just gorgeous! They arrived safe and sound, as promised, and I love them! The umbrella planter has arrived and I love it and the color, which was custom glazed in the perfect color to beautify my patio table. Stars......5 stars!!!!!!!!!! I got the umbrella planter!! Thank you and it looks great! The umbrella planter arrived....Love it! love it! love it! PERFECT! Thank you for the handsome glazing result. I can't wait to fill the planter with beautiful flowers. Hope you have many deserving sales! Just wanted you to know that the beautiful African Violet bowl arrived in wonderfully good shape (very well packaged). It is just what I wanted and more. I just opened the box from you. Oh, I am so very happy with the umbrella planter!!! It is the perfect color for our table set! Thanks so very much for sharing your talent. Continued good luck with your business! The umbrella planter has arrived and it is great!! I love it! Thank you!! The umbrella planter has arrived and is planted and in place on the table. It looks fabulous. I thank you for your creativity and your efficiency. It was a pleasure doing business with you! The umbrella planter has arrived and I love it!!! The butter keeper arrived safe and sound on Friday and is a perfect match to my canisters (minus the sage green band that we agreed would be too hard to try to match). The shade and the speckles are exact so I'm excited. I love this concept since we always did prefer butter over tubs of margarine, but I wasn't motivated to do anything about it until I read about the butter keepers. Thank you so much again. Enjoy your Memorial Day holiday and your summer. We were finally able to go without a sweater or jacket all day today for the first time in forever. I received the umbrella planter....it is beautiful and was so well packed! So excited to start planting some flowers over the holiday weekend. Thank you so much! It's beautiful. My birthday brunch is tomorrow! The umbrella planter arrived and it is perfect!! My sister got her umbrella planter and she loves it!!! Very nice violet pot that was carefully packed. I got the umbrella planter today , looks so nice!! I received the package and the deer are just wonderful -- so pleased. I love the umbrella planter....it's gorgeous!! I can tell it was packed with care, thank you! The color is just fabulous! I love the green and brown, our patio furniture is brown, so it will be perfect! Now I just need the weather to be nicer so I can get my garden and flowers going. The planter arrived today safe and sound! I absolutely love it. It makes the perfect addition to our patio table. Can't wait to fill it with flowers. Thank you so much! The umbrella planter is fantastic, just beautiful; we will enjoy it for many years. And you are also an expert packer. Sandy does such a great job on these birdfeeders; this is the 2nd one I've purchased from her. The color is perfect and my birds just love the open shape. The 2 violets pots are beautiful. They were shipped promptly and very securely packed! I love my ruffled tart burner!!! Shipped and wrapped VERY well!!! Thank you for getting the umbrella planter done and quickly shipped. It was also packed very, very securely. Everyone loved it Christmas morning. Hello! I just received the package! I only opened it enough to peek at the color of the umbrella planter! Nice!! It is so well packed I did not want to unpack it since I have to travel a short distance with it. Thank you so much for your patience and quick turn around time and delivery! Best wishes for a happy and healthy holiday season ! Just want to thank you for sending the Dinosaur set... I received it today and it is so cute. Will be a perfect fit in my toddler's bathroom, which is going to be all in dinosaur decor. Thanks again, too cute! I love this butter keeper and it is perfect for the holidays. Thank you for making her so happy with your talents. I will keep you in mind for future gifts!!! The butter crock arrived yesterday, it is beautiful! It was packaged so well that it took me awhile to unwrap it and get to the "goods". The pots are soooo nice! The cobalt blue color is wonderful! They look perfect around the umbrella. Thanks also for the fast delivery. It was so kind to rush in time for the party. You rock!!! The cat violet pot is absolutely adorable!! The butter keeper is so cute, exactly what I wanted! Shipped fast and was packed very carefully. Thanks again! I have received the items that I ordered and they are lovely and were extremely well packed! All are very nicely made and I am very happy with everything!! The umbrella planter arrived in perfect condition and looks FABULOUS! Love the color!! I am delighted with my order! I especially like the umbrella planter. Now, I just need to find something cool to fill it. Thanks again. I am sure you will be hearing from me again soon. My order arrived in good condition yesterday. I love both items and I'm sure my friend will be very pleased with the votive candle holder and the tea bag holder. It was a pleasure to do business with you. I really appreciate the care you put in to packing all the items and your fantastic customer service. I have put silk flowers in the little owl planter and a votive candle in the little kitten. The butter keeper is working great and is lovely to look at. The mushroom wall plague is in my kitchen. I'm sure you will be hearing from me again. The umbrella planter arrived in perfect condition! Love it!!! Just wanted to let you know the espresso planter arrived in perfect shape and color. Thanks again for your help. The umbrella planter arrived safely and it is lovely! It is gonna be the pop of color I need to finish off the back porch!! I absolutely luv the two planter you made for me with the kitties. They are sooooo adorable. Of course, everything you make is wonderful. I so appreciate you doing your beautiful creations for me. Can't wait for more. Thanks Again & Again!!! The conch shell planter arrived. You did a beautiful job!!! The planter goes with everything...even the tiki salt and pepper shakers! Omg It was totally like Christmas morning I woke up and check my email and saw that the package was delivered and could not wait to get to the front door. I was totally excited as I unwrapped ALL of that packaging. And I was blown away when I finally got to the three pieces. They are much more beautiful in person then I saw on the Internet. You truly have a gift and these are totally beautiful. Thank you so much for working with me and sending these to me you have Made my back deck complete. I will definitely keep you in mind for future orders. Too bad I didn't have a store I would purchase your items to sell here. I am so happy with my order thank you so much. I received the planter and it is beautiful. Thank you so kindly. Planter arrived and it is planted and ready to enjoy! The planter arrived this afternoon. I absolutely love it. . .its beautiful! Thanks so much!!! Planters have arrived in good order. Very Pleased!! Package arrived Friday (and my pet sitter brought it inside). Everything is intact and BEAUTIFUL! I can't wait to plant in them tomorrow. Received the planter...love it!!! So well packed, arrived safe and sound. Love the planter! So hot here I planted with succulents so I only have to water every other day. The violet pots are absolutely lovely! Thank you so much for the beautiful work. I know Grandma will love them, and I’m sure we’ll be ordering from you again. Just wanted to let you know that I received my planter, and I love it!! Thought you'd get a kick out of seeing the finished product. Thanks again for all your help. I may be sending some referrals your way. The planter made it in one piece thanks. I think it looks great but momma hasn't seen it yet. Not to worry though, I'm sure she will love it. Thanks again and keep up the good work!!!!! Received the planter today. All planted up!! It's perfect!!! Will look great when the plants fill in. The planter arrived at my mother's house. She is thrilled with it- she says it is absolutely beautiful and that it was packaged very securely. Thanks so much for your artistry and care! Cindy and I have received our planters and we are both absolutely delighted! You certainly go the extra mile for your customers, and I have appreciated your attention to detail and communications from the get-go. Just the packaging was an adventure! My planter is perfect for my table and I hope to get to see Cindy's one of these days. Thank you so much for creating a custom design for a hard to find item! I will be happy to pass your website along to my friends. I received the planter and I LOVE IT!!!!!! Here are 2 pictures of my umbrella planter with herbs in it. Herbs do not attract bees and bugs so it is perfect for the table. We got the umbrella planters and they arrived in perfect condition. We love them! The umbrella planter arrived and it's lovely!! Thanks so much!!! The planter has been delivered, wrapped in swaddling layers, intact; and it looks fabulous! We will send pictures! We are delighted with our recent purchase. Enclosed are two photos of the planter on our deck. I received my planter today and it is just BEAUTIFUL!!!!! It is exactly what I wanted!! Thank you so much for your gorgeous handiwork and for getting it to me so quickly. I am having a brunch on Sunday, so I am off after work to get flowers for my new planter. Don't be surprised if you get orders from this!! My son, the professional photographer, took this shot of your planter. OMG, I just love it. The ladies at the brunch all loved it too! I can't wait to show it off again this weekend at another BBQ! I hope you have a wonderful Memorial Day weekend and continue to feel GOOD! By the way, I do have to say the umbrella planter make my table look elegant!!! The umbrella planter traveled perfectly and I love it!!! The dinosaur bath set arrived and it is beautiful!! Umbrella planter arrived and I love it!! I received the violet pot you made for me. It came out great! Hi. My umbrella planters came today. Thanks so much!! I love them! The umbrella planter arrived in fine shape this morning at 9:30AM. I happened to be at my parent's house when it arrived and we are more than thrilled with the quality of the pieces and the lovely cranberry color. It is just perfect! Again, we would like to thank you for the great service and we will certainly pass you name on to others we know that may want to order them. The dinosaur bath set arrived in perfect condition! Sorry it took me a few days to write to let you know, we just got the box opened today, thanks for packing them all so safely. Donna is quite excited to put them in her bathroom! Just wanted to thank you for the speedy service for my order, I purchased the african violet planter. I bought it for my mother's 91st birthday gift, and I know she will love it. It is a very nice finish, the color is her favorite, and I can't believe how carefully it was packed!! You have gone above and beyond for customer service! I received my umbrella planter and love it! Hopefully it will warm up soon so i can plant some flowers. The lotion dispenser came today and it's beautiful!!! Hi Sandy -- Everything arrived in great shape -- amazing packing job. I only opened one -- looks great. I will leave them well-protected until spring. I absolutely luv them all and thank you very much for all you do. You do the most wonderful creations ever!! I will be getting back to you soon for a few more things. I hope you are having a wonderful New Year! The horse plaque is better than the picture so beautiful!!!!!!!!!!!!!!!! The horse plaque arrived and it is even better in person!!! Got the clock and love it. Thank you so much. The planters make it today safe and sound. Thanks again for your artistry, care and craftmanship. I appreciate you and your work. My cow butter dish arrived just fine, thank you. It's lovely!! The violet pots arrived & are adorable. Thank you so much!!! The cat mini violet pots are sooo adorable. I am sooo pleased with them. I can't wait to see your other creations. I truly appreciate you doing these for me. The planter arrived and it is awesome! You packed it so well and it arrived safe and sound. I have unpacked it and already placed in on the table on our terrace. The planters arrived and are beautiful. Thank you for your wonderful artistry and service! I haven't had time to plant anything in it or to e-mail you that it had arrived, as I went out of town for a few days. Just came back today from out of town and the package has arrived. The planter is beautiful!!! I received the planter. It is very nice. Thank you! I cannot tell how long I have been looking for this. I honestly do not remember how I came across your name. It actually was through a blog of some sort where other folks were looking for the same thing and your company and another was suggested. I will have to look back at my notes. Regardless, thanks again. Boy, your husband sure does a good job of wrapping! Have a great summer! The planter just arrived and it is perfect! It was a pleasure doing business with you. Thank you for your prompt correspondence and follow through. The quail set is so beautiful! Very securely packed and fast shipping. Will definitely be a repeat customer. The planter just arrived and it looks perfect!! And the color is just what I was looking for! Thank you so much!! The planter made it safe and sound and looks perfect! Thanks so much. Everything arrived safe..I just opened it today because we were gone for a few days. Thanks so much for the dish you sent as a gift, that was really nice! The finish on the planter is beautiful. Thanks again...I will recommend my friends and family to you when they compliment my planter! LOL. Have a great summer! I just got the planter today 6/30/12,it is just what I wanted! Thanks so much, I like the color too I wanted it as close to real terra cotta as possible and it is , and thanks for the little dish. Nice doing business with you. The wonderful planter arrived today safe and sound -- that was an impressive packing you did! LOVE the planter and hope to get it set up still today -- I'll send photos. Thanks too for the very sweet dish. It's just exquisite! Your work is amazing. It's been a pleasure working with you. Don't be surprised if you hear from me again! Received the planter today, it was absolutely beautiful, my motherinlaw will love it. You also did an awesome job on the packing so it wouldnt get damage. So glad I found you online. I will def. be ordering more in the future. I got my feeder today! It is simply lovely and already hanging up in the pussywillow tree. The color is perfect. My planter arrived and it's beautiful. I'm so glad u emailed me. I was looking for your email to tell you how perfect it is, especially the color! Thank you so much! Just want to let you know the package arrived today and everything is just fine and love them! I have to admit I was a bit concerned, when I heard a "crash" on my porch this morning. I was a bit apprehensive when I opened the box, but everything is just fine! That's a credit to your careful packing of the box, certainly not to a FED EX man who was in too big a hurry to be careful, and just tossed it on the porch, rather than gently laying it down. Ha! No matter. I've kept your email address and will order from you again. Thank you so much for a fantastic transaction! Will recommend your work whenever possible!!! Indeed it did arrive - already in place, and I love it. As soon as the little plants look better, I'll try to remember to send you a picture! My planter arrived this morning in perfect condition! Thanks so much. It is just what I wanted! The umbrella planter arrived and I love it!! The umbrella planters arrived intact, and they look great! I'm excited to fill them with flowers. I arrived yesterday and the umbrella planters were at my front door. They are lovely. The planter has arrived. It is beautiful and I am so happy with it. Yes, the umbrella planters arrived. Perfect!! Planting them Thrusday and will send pics from the party. Thanks again! I was at my Mom’s house on Saturday when FedEx delivered the planter. It is so pretty. what we wanted.Thanks so much! The umbrella planter arrived on Friday, safe and sound. Thanks so much, love it!!! on my breakfast table for my Fathers Day brunch. What a fantastic little violet pot. Love it!! The umbrella planter arrived and is beautiful! Thanks so much. Received your planter last week and have already filled it with plants. You do beautiful work and we are very pleased with it. The planter arrived safely and securely, looks fantastic! Thank you very much! I received the umbrella planter yesterday and I love it!! Thank you so much! I just wanted to let you know the herron set arrived. It is even more beautiful in person!! Got the planter Sandy---it's beautiful!! I love it!! Thank you!! I received the planter this weekend. It is lovely! Thank you so much! Love the umbrella planter..perfect!!! Thanks so much!! I received the planter yesterday, all in 1 piece! I love it! It's perfect! Thanks so much! The shell creamer and sugar made it here safe and sound! They are amazing, beautiful pieces that my mom will have for many years to come! Thank you again so much, we look forward to shopping your other beach pieces in the future. The cow butter dish arrived and it looks great! It arrived today and I LOVE it.. Thank you so much. I'll tell all my friends about you. I wanted to let you know that I received the planter today and it looks great. My Mother of Pearl Shell African Violet Pot arrived today, safe and sound, and it is gorgeous!! Now, all I need to do is find a nice plant for it. Everything arrived in perfect condition. The larger planter was the correct size. Thank you for such great service and quality products! I received the butter dish. It looks great! Just wanted to let you know I got everything in the mail today, and everything looks awesome! So perfect! Thanks again:) Have a great 2012! The planter arrived and it looks great. Can't wait to get plants to put in it. Thanks for the little birds. Good call on your part; We are bird watchers (and feed them every day). I received the butter dish safe and sound! It was in perfect condition and looked awesome. Thank you again so much and merry Christmas. Yes, the shell violet pot arrived and it is beautiful. Thank you! The cow butter dish has safely arrived. Thank you..it's perfect. Happy holidays! Got the butter crock. Its so cute. Thanks so much. The umbrella planter arrived today in perfect condition: perfectly beautiful, perfectly functional and perfectly beyond expectations. Thank you so much for your talented artistry and timely service. I got the deer a few minutes ago. They are wonderful!!! Thank you, thank you, thank you. I was hoping the color would be a good match for my deer but it's darker and redder. No worries though. I'm going to give them both to my friend for Christmas and continue to keep my eyes open for a match to the one I have. Honestly, I couldn't be happier with them. You Rock!! Our planter arrived today. It is in perfect condition - thank you! soap dish you sent! That will be awesome in my "new" place when I get it! If anyone is looking for ceramics I will definately give them your business! Thanks so much for everything & I will be in touch in the near future! I received the planter today, and it is great! Thanks so much. It's in perfect condition, thanks to your excellent packaging. Wow...Absolutely Stunning! I love the rooster and chicken as my dining table centerpiece! 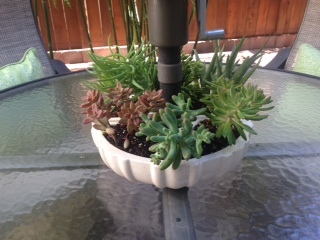 Yes, we received the planter yesterday and I planted it with succulents this morning. All is well. I received all the planters and they are all BEAUTIFUL! You had them packed so well. I will definately be ordering more from you! Thanks for everything! Have a great day! Yes, arrived just fine and is very nice - exactly the color and style I wanted. You did a great job with it!! Now, just need to get to the nursery this weekend and get something nice to put in it!!! Thanks so much for your help and I will keep you in mind for next time I need something, or if I know anyone else that does. I received the umbrella planter today. It is perfect in every way. Thank you for the wonderful product and the timeliness of the delivery. I just wanted to let you know that the planter arrived today. It is completely perfect and exactly what I've been looking for. I love the color too. You do beautiful work. The shell violet pots arrived Wednesday and look absolutely wonderful! More than worth it, and I've already gotten several compliments on them. Thank you so much! The umbrella planter looks great...doesn't it!!! I received my beautiful umbrella planter Tuesday. Thank you for your excellent service and product. I’m sure I will get inquiries and hopefully be able to refer you some new business. Thanks again! Your umbrella planter arrived today and it is beautiful! Thanks so much! The planters came in yesterday. They look amazing! Thank you so much! I was so excited about the planter that I really THOUGHT I had emailed you. Thanks so much. Passed your name on to friends. Just received the planter, put the flowers in and it is just gorgeous!!! Exactly what I was looking for! Hope to do business in the future too! Thanks so very much! 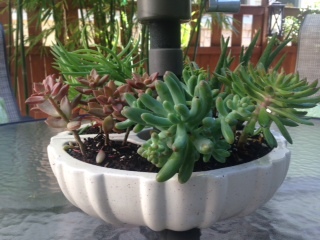 As I promised you, here are a few shots of the beautiful planter you shipped me, filled with succulents! I am so happy with how it looks, and especially now with the plants in! I received the planter yesterday. I had to open it to make sure it was OK and all is well. It is a very beautiful planter and I know that Tim will like it. Thanks for the very fine work. I just now received the wonderful black umbrella planter..Haven't planted it yet but wanted to email you photos as I promised..I think I shall plant some beautiful succulents inside, to match the rest of our pots, and planters! You can see from the photos how perfect it is for our table!! Thanks so much for the wonderful packing and shipping, I will hopefully find some other things I need from your great company! Thanks for all the email updates, I shall be sure to send another photos once the succulents are planted! I just wanted to let you know that the cow butter dish came in the mail today. Thank you so much. My Mom loves it! Your shipment arrived this afternoon and the planter is gorgeous. You were right, it is a beautiful color. Your packing was impeccable. Everything came through perfectly. You’re the best! I love them! They’re a perfect match. Thank you! As soon as we set the table, we’ll send photos. The umbrella planter arrived today. I LOVE it! The color is gorgeous and I can hardly wait to fill it with plants. Great packing job! I got home really late last night and opened it this morning, both my husband and I love it and we'll be filling it with succulents this weekend! Thank you so much. I got it yesterday and LOVE it! It has great color depth and variation. I was very pleased with the outcome of the glaze coverage (and the sturdy structure of the piece itself). As a matter of fact, and after reading so many patio blog comments about how hard these planters are to find, I was going to carry it with me to my favorite garden center--Appenberry's-which stocks great planters, so that I could pick out plants for it and at the same time give the owner your info to order some pieces for her shop. I'm sure they would be popular and you appear to be the kind of supplier they would want to work with! Glad I found you in that blogger's column I was reading! I just got home and the kitties are here!!!! WE LOVE THEM!!!!!!!! They are SO CUTE! Beautiful, hand-crafted pottery Shell Violet Pot...I love it!! Great shipping and packing! The planter arrived fine and well packaged. I set it up yesterday with red impatiens and it looks great. I received the planter today. I love it!! I can’t wait to plant some flowers in it-it is just what I was searching for!!!! Thanks! It's gorgeous!!! The color is perfect with my red umbrella! I'll go out tomorrow and see if there are any annuals left this summer and get a photo of it for you. Thanks so much. The packing was fabulous! And if you need a recommendation feel free to use me! I received my planter in good shape, and I love it! Thanks. I wanted to shoot you an email letting you know that I received my planter. It is great....I love it! It got here safely and the packaging was great. I like the color but haven't put flowers in it. We are heading out on a road trip to California tomorrow so I'm waiting until I get back. It's very nice and matches my rust like color patio furniture. Again thank you and I'll pass your business along. Just wanted to let you know that I received the umbrella pot today....everything was in perfect condition...and I love the piece...it's just what I was looking for! Just back from OH and found my beautiful pot here safe and sound. Thank you - it's beautiful. The planter has arrived and we love it! The color is perfect! I filled it with pink begonias. It's beautiful. No, the planter is not "okay". It is BEAUTIFUL! Hi Sandy. Just wanted to let you know that the planter arrived today safe and sound. And I have to say...its awesome. Exactly what I was looking for and it looks great on our patio table. I can't wait to get planting! My beautiful umbrella planters arrived today in perfect condition. I can’t wait to find the time to fill them. Thank you. I just wanted to let you know that I just now received my planter via FedEx. So, Thank-you once again. It has been an absolute pleasure doing business with you! My husband brought them home yesterday. I unwrapped them and wow!!!!!! The black one is stunning. Just awesome. Will be beautiful on my patio. Sandy, I love them, truly love them. Thank you so much for making them for me. I will think of you everytime I look at them. And thank you so much for sending that little dish. It's so nice. Love it to. You are thoughtful and kind to do that. YES! and I actually opened it this afternoon! been sooo busy! It is AWESOME! I have waited so long for something like this! I will leave you AAAAAAAA++++++++ Feedback! You are the BEST! I got the planter today and it's EXACTLY what I wanted! So well made and very well packed! Thanks so much! I recieved the planter today! It is really nice! I can't wait to plant it with flowers! I really like the white color. Thank-you again. Hi, Sandy - wanted to let you know the planters arrived safely and they're great! They'll add a lovely touch to the brunch tables. Also, thanks for the pretty soap/"whatnot" dish - I'll probably use it for the latter in the bedroom to deposit stray jewelry, etc. I wish you well with your business and will plan to send a picture sometime after the wedding. Hey there Sandy!!!! I just wanted you to know that my planter arrived safe and sound!!!! IT IS ABSOLUTELY BEAUTIFUL!!!! I appreciate you so much doing this for me!!!! I may order a few more in the future!!! Have a wonderful weekend and thanks again!!! I love everything... And I can hardly wait to get home and get everything where it belongs... and planting. One question... how do I change the battery in the clock. I especially love that.... I think I'd like to get one for my mom for mother's day... Do you make them bigger? Again, I can't wait to get my items home! First class all the way!! Thanks! I received both boxes yesterday evening and the canisters and utensil holder look great. I am exceptionally pleased with them and have already set them in their places on my new countertops. They look like they really belong there. Thanks again for the great product/work. I just got my lotion dispenser and it is great! It looks just like the picture and I love it! Now I just have to wait for my husband to finish the bathroom, (we took it down to the studs and are putting in new drywall)! I love this Christmas tree! Beautiful! Keep up the work! We received the planter in good shape and we love it! I did receive the planter and it looks great! I sure apprieciate all your kindness with this. I love the little boxes! Thank you so much for getting them done for me and for the courtesy discount. Very good service from FedEx the violet planter came this morning. It looks great and I'm very pleased! It's a little bigger than the ones I have which I do like better...gives the violets a little extra room to grow. Thanks again and I'll probably order one for me next month. Package arrived today. Very happy with the deer figurines! Thanks. Very pretty hinged box and fast service. The planters arrived today in perfect condition...They are beautiful! I hope to do business with you again sometime. I received the planter on Saturday, it is gorgeous! Item is super cute! Thank you. I just got the butter dish and all I can say is "wow!" It is so much cuter in person than in the photo and so well made and painted too! Thank you so much! My teenagers saw it and named it "Buttercup", tee hee. Thank you so much Sandy, I'm sure my friends will be asking where I got it and I'll be sure to let them know! Received the package yesterday and opened it today! WOW! Can I leave additional feedback on your eBay site? well as a very considerate and detailed shipper. The ceramic umbrella planter and the patio candle lantern are gorgeous! Can't wait to find some nice greenery for the planter and enjoy looking at it all summer. And THANK YOU for the little votive candle. I plan to put it in the lantern and enjoy - maybe on the Fourth of July evening? Beautiful! Thank you for providing extra protection in the package! These are too cute!! Very happy with my items and service! Beautiful planter and wonderful service. Thank you!